“I really wanted [my photographs] to pay homage to a lot of the simple things that happen in the kitchen.. This week, we're excited to welcome Nik Sharma to SALT + SPINE, the podcast on stories behind cookbooks. 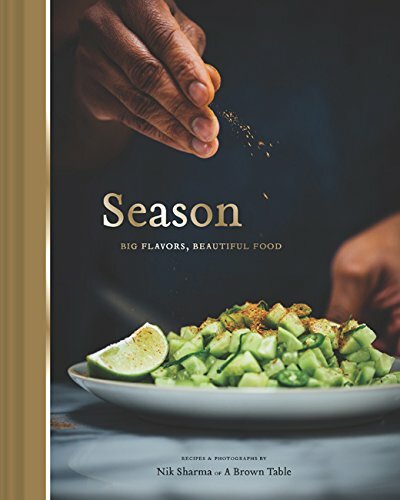 Nik is a cook, author and photographer of Season: Big Flavors, Beautiful Food, his first cookbook. The Bombay native fell in love with cooking as a kid, but only after a move to America and a pharmacy degree later did he begin to pursue his deep love for cooking. Through his blog, A Brown Table (and later a San Francisco Chronicle column, A Brown Kitchen), Nik documents his exploration — and celebration — of time spent in the kitchen and how the flavors of his life influence the food he creates. We sat down with Nik at the San Francisco’s The Civic Kitchen to talk about his home cooking-first approach to food, what he looks for in a cookbook and how he proudly tells his own story — that of a gay immigrant — through food. Plus, in this episode: The Salt + Spine team cook from Season, we talk spices with Oaktown Spice Shop’s Erica Perez and go Into the Vault with Omnivore Books’ Celia Sack to learn about cookbook authors that have shared Indian regional flavors with global audiences.